Brandi Nell the Southern Belle: WOW! Holy before and after! WOW! Holy before and after! Happy Tuesday (hint of sarcasm?)! As I mentioned in my last post - this has been a crazy few weeks for me. I haven't been able to work on any projects lately... not that I haven't wanted to. Right now, I have two unfinished nightstands sitting in my "one-day office." I am hoping to finish them this weekend! Cross your fingers for me. BUT! 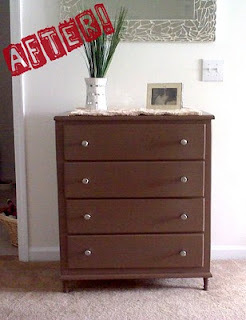 I do have an awesome before and after for you today! My friend and classmate from college, Shaheen decided to do a little furniture rehabbing of his own after seeing some before/after pics I had done. I have to admit, I was a bit flattered (well, still am). Shaheen emailed his before and after to me this afternoon - and I am so excited to share them with you! 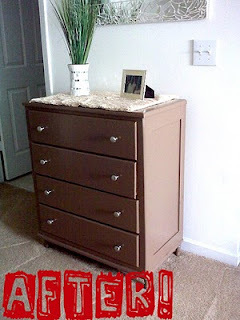 Shaheen bought the dresser at a local yard sale from a carpenter for only $3.00!! What a steal!?! 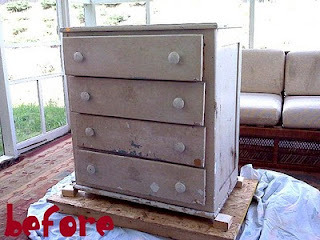 The 70 year old dresser required some work, but once you see the finished product - you will agree that it was well worth the hassle! The piece needed some work, so Shaheen scrapped off the flaking paint, sanded it down, selected an earth chocolate brown paint, added some new brush nickel hardware, and legs. WOW! WOW! WOW! The entire thing only cost Shaheen and his wife, Renee $25.00!! Good job, Shaheen! Can't wait to see your next project! Geek B this looks great! Check out my latest post, I gave you props! Hi there! Found you through Mrs. Grits versatile blogger post. Looks like you have a fun little blog...I can't wait to read more! thanks so much, ladies! You guys are so sweet! Anna - thanks so much! You have no idea how much that means to me... as a new blogger - I am so excited that YOU gave me props! Thanks, LADY! Sarah - so glad you found me here! Looking forward to seeing you on here again!